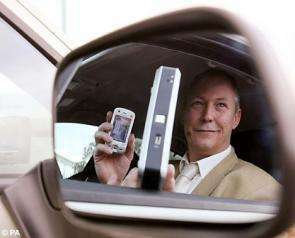 Phillip Tann of Autopoietic Systems used his invention of a speed detector that works with a GPS cell phone to prove to a court that he should not have been issued a speeding ticket. A scientist has won a court battle over a speeding ticket using a speed detector he invented, which may soon be available on a commercial basis. In November 2006, Phillip Tann was driving through Sunderland, UK when he was clocked by a police radar gun doing 42 mph in a 30 mph zone. But Tann, a scientist at Autopoietic Systems (Tann Ltd), was testing out a new speed detector at the time that he himself had invented. The device, called the Autopoietic System, is used with a cell phone that has GPS and can measure data over distances of less than half a meter (traditional GPS devices work on distances of around five meters). He explained that the device is comparable to an aircraft's "black box" in-flight recorder. According to the Autopoietic System, Tann's speed was a mere 29.177196 mph. So when he was charged with speeding and given a court date, he decided to contest the ticket. In the end, the ticket was repealed, which he claims was because he showed the court his system and how it was superior to the current one used by the police. The police, however, have a different story. They explain that the policeman's original detector reading was correct, and the only reason Tann was let off was that the prosecuting officer had left the force and could not come to court. They claim that the 29 mph reading referred to an average speed over a certain distance. "The application records the speed, time and location of a GPS-enabled mobile phone," according to the company's Web site. "Should the user be accused of a speeding offence, then the user has the choice to produce the information for evidence. The certificate can also indicate the driver's acceleration/deceleration and direction of travel." Tann thinks that his case could open the doors for other motorists accused of speeding. Autopoietic Systems has a product release date for this device planned on December 1, 2007, according to their Web site. The company is also releasing products that can serve as an aid to people suffering from Alzheimer's Disease and for parents who want to know the location of a child. Cops are just people, they have the same percentage of murderes, thieves, liars etc.. as the rest of the population. A microwave oven tube permanetly fries the array in their laser gun. Easy to build but takes a lot of power. Smokes them for a long long way if they hit the trigger while you're powered up. Have some fun!